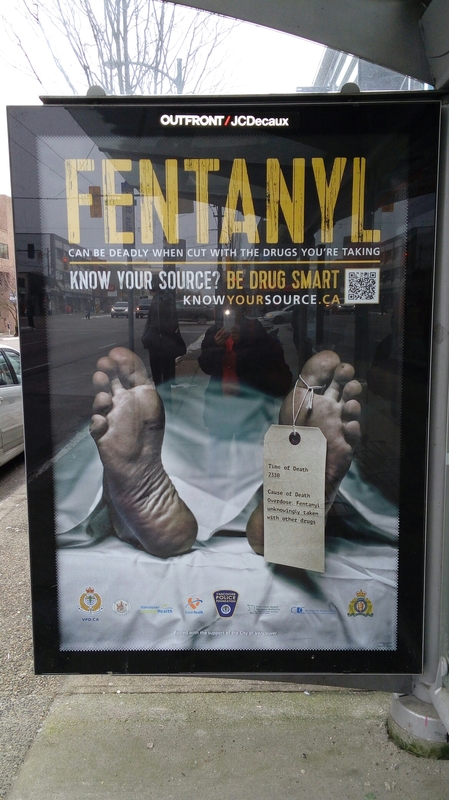 It was great to see a poster at my bus stop here in Vancouver warning people about the dangers of fentanyl. This seemed particularly pertinent this morning as I was on my way to the Downtown Eastside, the central location of recent fentanyl overdoses. Here in British Columbia there is a massive public health emergency – scores of people are dying from fentanyl overdoses. Often it is cut with other drugs or simply sold as other drugs such as oxycontin. It is so potent that it can be easily imported into Canada from China in small packages that border control are powerless to open and check. The danger seems to stem from the relative potency of this opiate. The pure drug needs to be accurately weighed by the producers once it arrives in Canada, a single dose is the equivalent weight as a grain of salt, and two grains of salts worth is enough to cause an overdose. This requires expensive equipment and quality control that does not exist on the illegal drug market. As a European I wondered why there are so many people in the city addicted to opiates. One theory is that the threshold for doctors to dispense opiate pain relief is much lower in Canada compared to other countries in the west. Opiates are given for moderate to severe pain in Canada, which may mean more of the population become dependent on this type of pain medication. The city and the province is in crisis. One day before Christmas up to nine people died in a single day from suspected fentanyl overdoses in downtown Vancouver, with another four suspected fentanyl overdoses province wide. The emergency services are overwhelmed, with paramedics, fire services, and health centres attempting to save lives with naloxone kits. 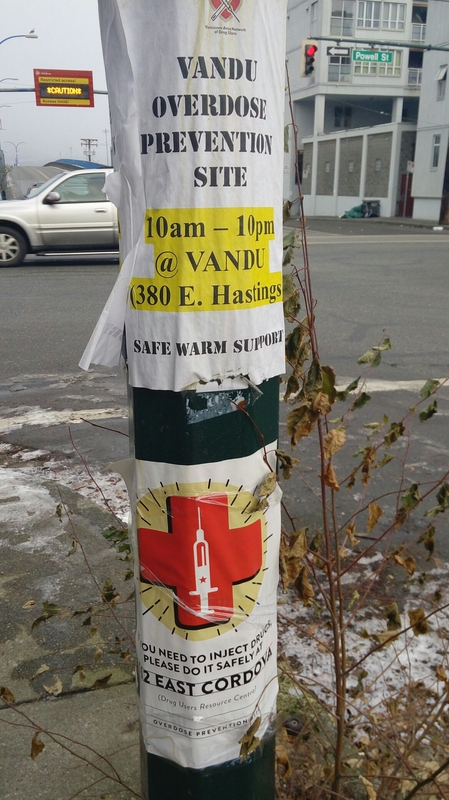 This morning, while in the Downtown Eastside, I saw evidence of the attempts people are making to combat this crisis, including safe injection sites. As amazing as this is, and as much as a public health campaign is needed to warn people of the current danger inherent in taking any sort of opiate street drug, the source of the problem is not being tackled. I am not an expert on Canadian drug policy, but from my reading it seems that border control need to be given the power to be able to intercept fentanyl being imported, and policy makers need to take a look at current regulations and and guidance on the dispending of opiates for pain relief. Something needs to be done to reverse this crisis, and stop it spreading further across the world.